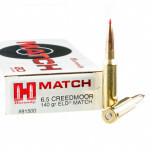 The 6.5mm Creedmoor is a target shooting cartridge designed for precision match shooting. 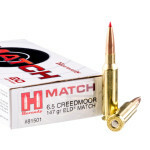 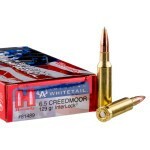 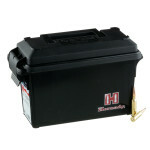 Its development is credited to Dave Emary of Hornady and Dennis Demille of Creedmoor Sports. 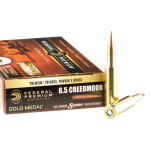 Designed to operate at .308 Winchester pressures while firing a lower caliber bullet at a higher velocity, 6.5mm Creedmoor ammo produces trajectories comparable to .300 Win Mag loads without the heavy recoil of the magnum cartridge. 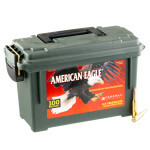 It is a medium length cartridge that can be chambered in most bolt action rifles as well as AR-10s. 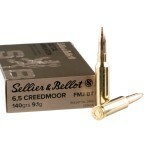 This caliber uses a large rifle primer and was introduced in 2007. 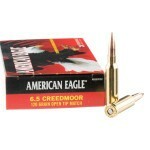 A typical round of 6.5mm Creedmoor target ammo fires a 120 grain bullet at a muzzle velocity of 3,000 feet per second. 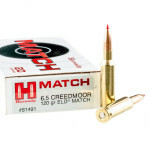 Hornady's AMAX polymer tipped match bullet is a common choice, as it provides excellent accuracy. 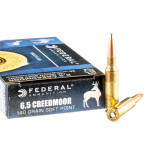 The 6.5mm Creedmoor maintains a very flat trajectory and is extremely accurate, even at 1,000 yards. 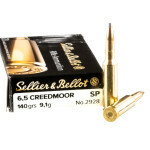 Some loads use heavier bullets, which provides additional stability and resistance to crosswinds. 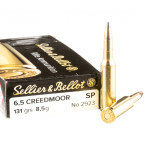 Although originally intended for competitive use, the 6.5mm Creedmoor has gained some traction in the hunting world as well. 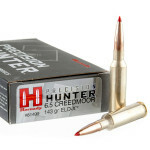 The cartridge's accuracy is a major asset for long range hunting, as it enables the shooter to make clean kills more reliably. 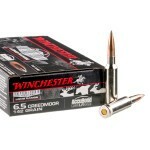 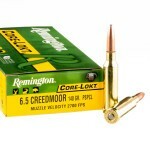 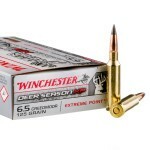 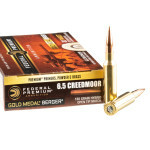 6.5mm Creedmoor ammo is effective against boar, mule and whitetail deer, and elk. 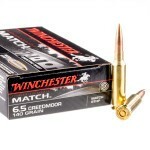 Hunting rifles offered in this caliber include the Ruger American Rifle and the Savage Model 12 and 16. 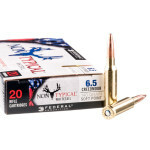 Ammunition for this caliber is available from several manufacturers including Winchester (Match), Hornady (Superformance and Match), and Federal (American Eagle).